The 'Morning Light' is also a taller variety, growing to 6'-8' tall and 4'-5' wide. It has delicate feathery plumes and very thin graceful leaves. This is a variegated form with white leaf margins that shimmer in sun. 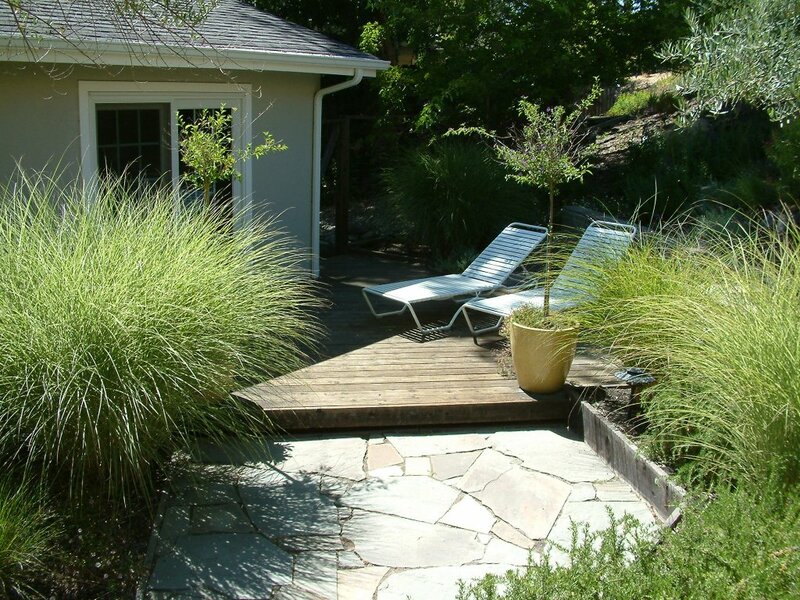 It should receive sun to part shade, and average watering but more during hot spells. This plant looks better with more irrigation. Tall grasses are highly combustible. Rosemary is hardy in full sun areas where winter temperatures do not drop below 10 degrees F. Rosemary is evergreen and makes a great aromatic hedge, 4'-6' tall and 2' wide. Foliage is used in cooking. Blue flowers appear in summer. This plant is drought tolerant once it's established. Bees love Rosemary! This plant will grow 6 x 8' wide and produces beautiful purple flowers tha bloom all year. It does best in full sun and is very drought tolerant.